Momentum usually is an illusion deep in the Stanley Cup playoffs, when every team is good and no one can predict the bounces of a vulcanized rubber moon pie. That being said, the Rangers emerged from Game 4 of the Eastern Conference finals with all sorts of happy news. The big national story in their 5-1 rout of the Lightning on Friday night was the return to form of goaltender Henrik Lundqvist after back-to-back losses in which he allowed 12 goals. But to the Rangers themselves, that was considered a given. The real news inside the dressing room was what their second- and third-most-famous players did. 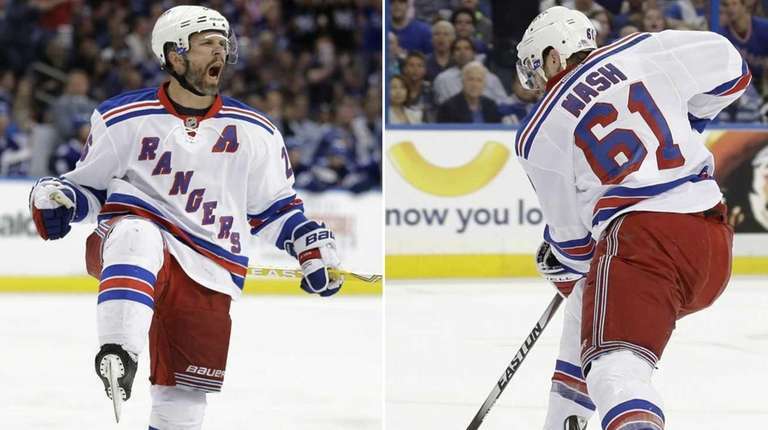 Between them, Rick Nash and Martin St. Louis had three goals, which was one more than their total for the first 15 games in these playoffs. There is no guarantee that will carry over to Game 5 tonight at the Garden, but the sense of relief from both of them after Game 4 was palpable. Nash was asked after the game if a weight was off his shoulders. It is the kind of question elite athletes often dodge. He did not. "Yeah, for sure,'' he said. "It's just natural to grip your stick a little tighter and not see the ice as well when you're struggling. The puck doesn't feel comfortable on your stick. Any time you can get a goal and get a little confidence, it helps." Later, he admitted how much it bothered him that he had only two goals in the playoffs -- which before Friday night had left him with six in three postseasons as a Ranger. "It's frustrating when you can't score and you feel like you let the guys down in the room," he said. "You let everyone around the organization down when you can't finish offensively." Nash, one of three players selected to address reporters, spoke again yesterday before the team left Tampa. 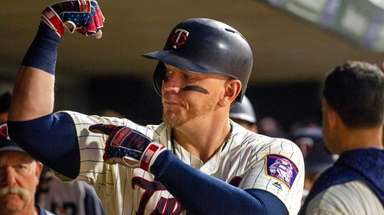 He said after sleeping well during his slump, he did not after his breakout game, something he found "strange" and "weird." Maybe he wanted to stay awake to make sure it hadn't all been a dream. "It's a struggle when you're not scoring," he said. "I think it tests you mentally; it tests you emotionally. 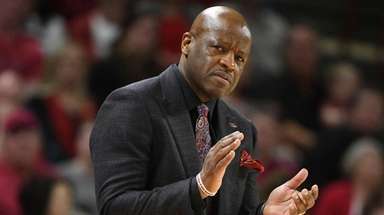 But at the end of the day, it's not about you, it's about the team and anything you can do to help the team win." At least Nash had been contributing in other ways before largely disappearing in Game 3. St. Louis, a proud future Hall of Famer, had been scoreless in the playoffs, benched earlier in the series and moved off the top line. What's worse, he was playing in the city where he rose to stardom -- and was being booed whenever he had the puck. Then it happened: a trademark St. Louis blast on which his left knee touched the ice. Whew. The morning after, St. Louis admitted his slump had him pressing. "When you score, you definitely gain confidence from it,'' he said, "and I'm hoping that I can play with a lot more confidence from that." Coach Alain Vigneault said he noticed that after St. Louis scored, he had several other good looks. 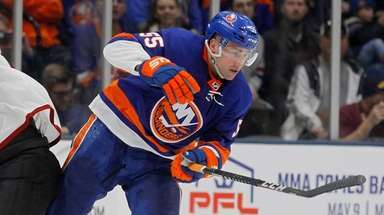 "He's been the consummate pro here,'' Vigneault said, "even though it's been a test for him to get on the scoresheet and score some goals, which he knows that's part of his mandate with any team, especially ours." Nash scored 42 goals in the regular season, twice as many as anyone else on the team. St. Louis had 21. Having them return to the land of the finishers is exactly what the Rangers needed against a high-scoring opponent. Said Lundqvist: "It's always important to have guys like that score . . . Even though they do so many different things to help the team, I think when they put the puck in the net, they get a little extra confidence." All of which means what for Game 5? Who knows? But for the Rangers, for one night at least, it was nice to hear from a couple of big names who had been coming up small. 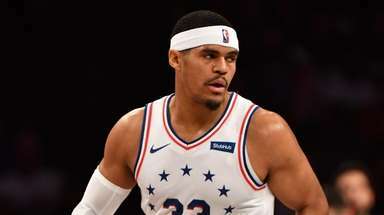 "Yeah, a good feeling, but for me, it's one game," said Nash, who also contributed this past week by arranging a team screening of the upcoming "Entourage" movie Thursday night. "It's not that big of a deal. Things can turn around pretty fast. Whatever happened [Friday] night is over. We'll try to carry some momentum, but at the end of the day, it's a new game, and it starts 0-0 again."